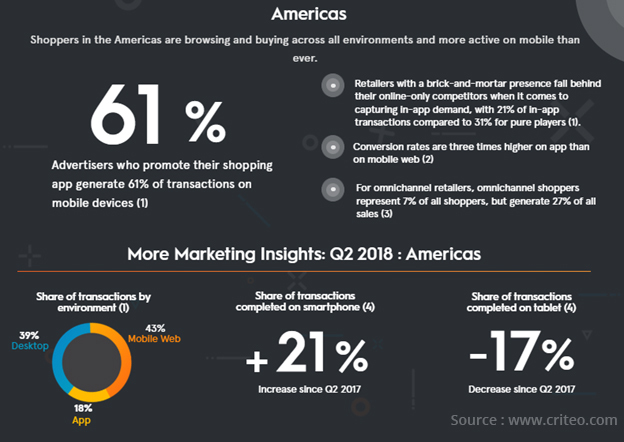 According to the Criteo’s Global Commerce report for the second quarter of 2018, mobile transactions are going crazy with more than 50% of online transactions in many countries. The Criteo’s report examined the buyer’s activities, behaviors, and preferences across multiple devices and navigation environments to record data of more than 5,000 retailers from more than 80 countries. The data in this report can be used to gather insightful statistics to define the possibilities and trends of the web and mobile applications. According to the report, apps are the major driver of online sales, with an annual increase in the proportion of transactions in the app by 30%. 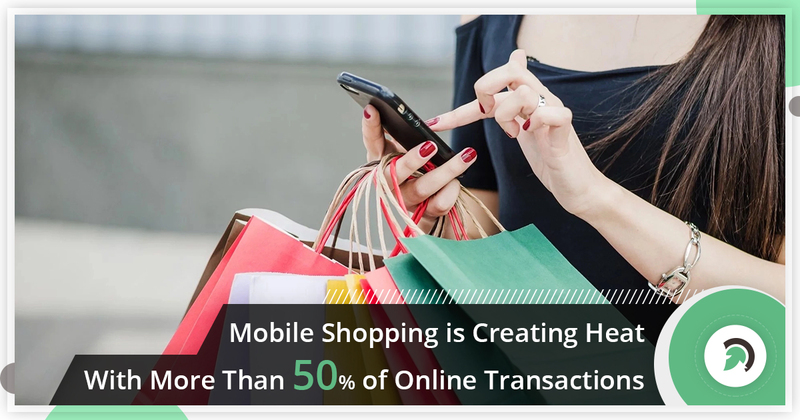 According to this information, we get to know that, customers are more likely to do shopping from a dedicated app from a merchant rather than from a website either it is from mobile or web. 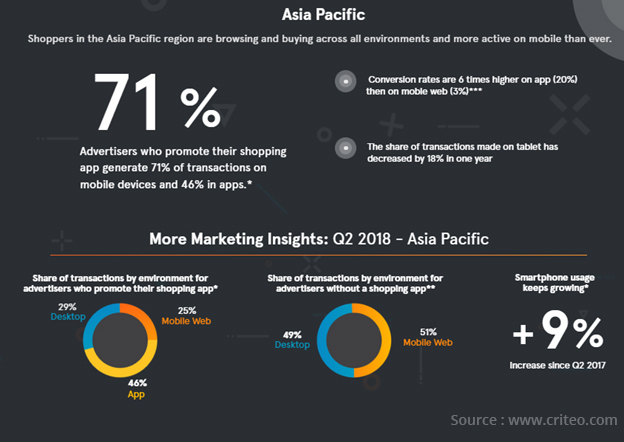 If we go through the report, the conversion rate from shopping applications is three times more than that of the mobile websites in North America alone. 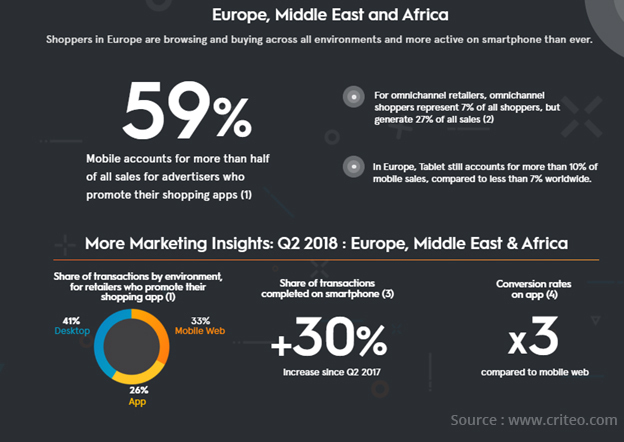 The data from Criteo’s Annual reports help digital marketers to plan and open the curtain on the internet leading more mobile applications into the use. This insightful results can change the way of marketing forever. Among online-only retailers who promote their app, 31 percent of transactions come from the in-app purchase channel. That number more than doubles when looking at Omnichannel retailers who actively promote their app, with mobile purchases representing 65% of their transactions. We saw that online merchants who were promoting their apps get 31% sales from their integrated shopping channel. This number gets doubled for Omnichannel retailers who actively advertise their apps through social media and Google Ad campaigns resulting in a significant increase in customer’s mobile purchases. This activity leads to the growth up to 65% of the mobile transactions. This data is also helpful in offline sales, as retailers can examine their online and offline data to optimize their marketing efforts and could gain 4x times more sales in less marketing effort. Mobile shopping is increasing day by day because maximum people tend to use smartphones rather than using websites. Shopping Applications are convenient and easy to use and can be availed anytime, no matter what you are doing, eating or moving around places. This trend shows no signs of slowing down in the near future across all countries. At present, Japan and Northern Europe are the pioneers in mobile shopping. This means that there is an ocean full of opportunities in the US and other country retailers to upsurge their participation in the mobile transactions in the upcoming years. If you are planning to get your mobile application, Evince Development is an award-winning e-commerce and app development agency by a clutch which can build high-quality and responsive e-commerce applications.